Samsung has plenty of experience in crafting slim, powerful laptops but unlike its premium Series 9 ultraportable, the company's first Ultrabook, the Samsung Series 5 appears to be more of an 'everyman' device. It won't out-power Ultrabook rivals like the Dell XPS 13, Acer Aspire S3 or Asus Zenbook UX31 and it doesn't look jaw-droppingly attractive but importantly, and some would say crucially, it won't cost you the earth either. The Samsung Series 5 Ultrabook is available in two screen sizes, a 13.3-inch model and a 14-inch version, available for £799 and £849 respectively. Considering the majority of Ultrabooks retail for between £899 and £1100, this makes the Samsung Series 5 an attractive proposition for anyone on a budget. Both models pack in mid-level Intel Core i5-2467M processors, but the 14-inch model comes with an optical drive and a HDD capable of being upgraded to an impressive 1TB of storage space. Our review unit was the smaller 13.3-inch model but at 20mm in thickness, the Series 5 is still one of the bulkier Ultrabooks we've seen. It's comparable to the HP Envy 14 Spectre but unlike that machine, the chassis doesn't feel chunky. It has the sloping, blade-like appearance of other Ultrabooks and weighs a miniscule 1.5kg. The outward design is attractive without being breath-taking. The plain silver design is equally well placed at home or the office and the brushed metal finish won't attract smudges the same way a reflective surface would. Samsung takes a certain amount of pride in its bright screens, and the 300nit screen on the Samsung Series 5 is no exception. The lack of a Super-TFT coating means bright lights and reflections don't interfere with usability. This should prove popular with anyone looking to use the Series 5 as a mobile workstation although media enthusiasts might miss the richer colours and deeper contrast supplied by a reflective coating. The 1366 x 768 pixel resolution is perfectly serviceable for watching films in 720p high definition and the silver bezel doesn't intrude on the experience. Samsung has taken the middle ground on equipping the Series 5, opting for an Intel Core i5-2467M (1.6GHz) CPU, 4GB RAM and a 1366 x 768 screen resolution. The processor is part of the Sandy Bridge family (a prerequisite for Ultrabook-class) and so the graphics memory is built into the CPU core. Don't expect any hard gaming on the Series 5 – if that's what you're looking for; Samsung has crafted the Series 7 Gamer especially for you. Gaming aside, the integrated Intel HD Graphics 3000 chip doesn't do a bad job. You'll find streaming movies over Netflix or using editing programs like Photoshop and Dreamweaver is within the grasp of this machine. If you do crave a slightly bigger graphical grunt, the larger 14-inch Series 5 packs in a dedicated AMD Radeon HD7550M GPU. And, while both machines come with 4GB RAM as standard, there's the option to upgrade to 8GB for a bit of extra future proofing. Predictably, the battery life on the Samsung Series 5 is neither wonderful, nor woeful. We squeezed a reasonable 191 minutes from the Battery Eater benchmarking program - running with a looped 720p high-definition video in the background. Samsung quotes 6.4 hours of regular use on a single charge and with care, you can certainly manage this – lasting you almost an entire day at the office. This should be more than sufficient for most users but ideally we like to see Ultrabooks score past the 200-minute mark. 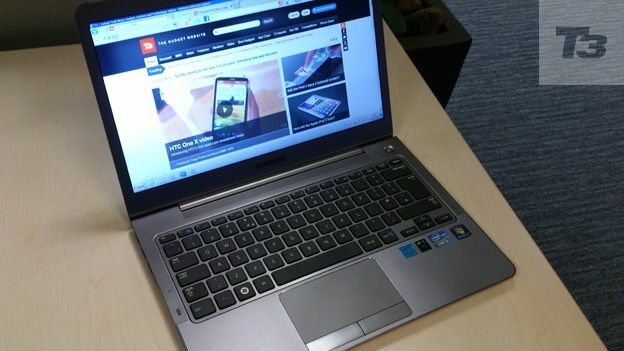 Samsung has produced a well-rounded and affordable Ultrabook in the Series 5. Thanks to a spacious keyboard, comfortable touchpad and anti-glare screen, this would suit anyone looking for a mobile workstation. The inclusion of a 500GB hard disk drive is something we haven't seen in an Ultrabook yet and impressively, Samsung has managed to keep the weight down to 1.8kg. Lastly, although power and battery life are sacrificed, the price-point of the Series 5 Ultrabook is particularly attractive and may give this machine a fighting chance against its better styled and more powerful rivals.